This is the best driving school around. Thank you very much John for everything you did for my son. You were fantastic. Your patience and commitment were outstanding. My son was so nervous that he didn’t ever think he will drive. You bring out the best in him and gave him so much confidence. I know now he will be a safe driver because of what you have taught him. I have 4 other children and you will teach them all. Highly recommended driving school. Believe me, you won’t be disappointed. John is the best. Lieve passed first time. Thanks john. I’d like to thank David who was very friendly and informative. Thank you so much for helping me get my license, and I would like to recommend Bartz driving school to anybody who is learning to drive. Thanks so much. Thank-you to David for getting Sean to pass his test. Best instructor ever. See you on 2 years when the next one is ready. Absolutely the best driving school out. John was no doubt the best and helped me boost my confidence up when driving. I can’t be grateful enough for all he did, and helping me pass my test with flying colours. All thanks to your amazing skills 😉 I can’t thank-you enough. My son had used 2 others but found this one the best professional helpful honest and experienced. Highly recommend. Bartz driving school, John you are awesome! I thank you so much. I never thought I could ever drive just keep taking transport & walking was my life purpose due to my personal anxiety after a accident at the age 15 stopping me from moving forward Look at me NOW 36 & I have my license. I’m glad the other driving school didn’t think I was good enough to reply back to, as your driving school was the right choice for myself. 100% recommend. John is an amazing instructor and he made me feel confident while driving. He doesn’t just make you drive he shows you different techniques and ways of remembering things. He breaks everything down into steps and makes passing your test achievable. Without Bartz driving school I wouldn’t have gotten up my hours or passed my test, there is a reason John was voted the best driving instructor! I would and do recommend Bartz driving school to everyone and anyone! Before having lessons with Bartz driving school I had very little confidence in my driving skills. After the first lesson I already felt more relaxed and confident to book my test. On the day of my driving test my nerves were pretty bad but John was confident in me and I passed. I could not have been happier with Bartz driving school and would not hesitate to refer others to Bartz in the future. Bartz Driving school has helped me to gain the confidence and knowledge needed to pass my driving test. They are reliable and are willing to help with any questions and/ or issues with driving you may have. I would recommend them to anyone going to do a driving test. Thankyou to Bartz driving school for helping me out and making sure I would pass my test. Having tried and failed the driving test twice my confidence was pretty shot, but having lessons with John really helped that. He’s a really friendly, easy-going bloke who makes you feel really comfortable driving with him. John helped me fix up bad habits I had developed and actually took the time to explain to me why they weren’t good driving, and helped me to understand what driving was all about. I never thought I would be the holder of a P1 license, as I am not very confident and a very nervous driver. But thanks to John, I got my license first go. He is the only driving school I have stuck with because he woke me up to the reality of driving. I became confident quickly and I know I will be a better driver because of what he has taught me. Highly recommended to anyone learning! Thank you John!! I would highly recommend John from Bartz Driving School to any nervous drivers out there going for their licence. I passed first time and scored 100%! Thank you, I couldn’t have done it without all of the driving knowledge I developed through his lessons. After failing my driving test four times in a row I decided to give Bartz Driving School a go. Not only did I realize why I’d failed the tests and how to be a better and safer driver – I also passed the test just one hour after my first Bartz lesson. Would definitely recommend to anyone about to take their P’s test or even someone looking to be a safer driver overall. Just thought I’d drop you a line to say thanks for sharing your experience. I have used Barzt Driving School for my three youngest kids, all getting their licences first time. John was patient & understanding, he could asses each situation differently knowing how many lesson were required for each individual & not just charging for unnecessary lessons, which was a cost saving for me. Have recommended him in the past & would do so again now, for honest response. Bartz Driving School is brilliant ! Not only do they guide you how to drive properly, they break everything down into segments and explain them in a way to which you understand, giving you skills and confidence. Passed my test first go!! Thanks heaps John!! Very good lessons, explains every aspect of driving descriptively and in an easy to understand way. John from Bartz is an amazing instructor. As a very nervous parent he offered great solutions to enable me to supervise my sons driving, giving both Ryan and I confidence as his skills developed. John is a strict instructor, but also fun to drive around with. You are guaranteed to learn a lot from him. Highly recommended! I got my p on the first go. John is very experienced and dedicated. He not only taught me the correct way to drive, but also explained and demonstrated very clearly why we should drive like that. In other words, he changed my driving technique mentally and physically. That helped me improve very quickly. I got my license on the first attempt! Strongly recommend! As a learner driver John guided me to confidence with the result of getting my P’s. Fabulous, amazing, awesome, fun service and would recommend to anyone! Get on it! John is a excellent instructor, experienced and dedicated. Highly recommend Bartz and John if you want your Licence in a timely fashion. Bartz was the best driving school I have been with, I am 22 and have tried with many driving schools! John was my teacher and he was great! I had my license within 1 month! I learnt everything I needed to know and more Bartz are also only $60! I would highly recommend Bartz driving school to anyone ! Passed P’s test on Automatic first go thanks to John. Informative, friendly, passed Ps test first go. 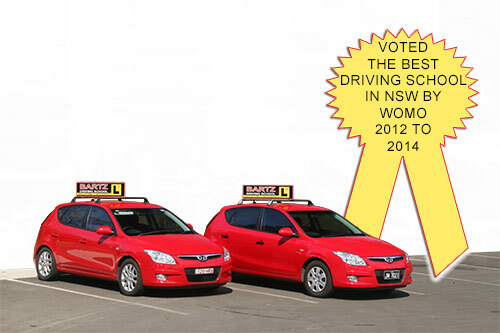 Recommend to everyone who wants to pass their test in the Hawkesbury region. Great service. I passed first go. Very informative. He let me try manual but found out very quickly i like auto better. Relaxed and great teacher. Mum reckons my sister should go with him. Great Driving Instructors.Very easy to get along with, and are great motivators. John, my instructor, has helped me to overcome my fears of driving, and is so easy to talk to. I really enjoy my driving lessons, and actually look forward to them! I have autism and struggled to find a driving instructor that really understood me. John from Bartz driving school was brilliant with me from the beginning, and I just passed my ps test with a perfect score. Highly recommend John for anyone else on the spectrum. I went with David for driving lessons a couple of months back now & can not recommend him enough! He was so incredibly patient with me & was very honest in when he suggested I was ready for my tests. Very professional & he made it a priority that he was giving me the absolute most of my lessons every time! I can’t thank BARTZ & David enough for such an easy experience, thank you! John is an EXCELLENT driving teacher. I WAS an extremely anxious driver when I started. Not for long, though. Today, I passed my first ever driving test. I owe it all to John and Bartz Driving School. Extremely highly recommended!! Thank you soooo much, John! You’re tops! We've put 3 children through Bartz driving school & can't reccomend them high enough. All 3 kids were very comfortable with John instructing them & looked forward to their lessons. most importantly, all 3 passed their tests and are confident competent drivers. What a fabulous driving school. I was worried my anxiety would stop me from driving before I died! But Dave being so patient, calm, laid back, knowledgeable and understanding has really made such a difference. I don’t feel incredible anxiety every time I take the drivers seat anymore and I feel so at ease. I now have no doubt that after a lot of time and practice with a great instructor I will be a confident, safe driver. Highly recommend Bartz!! Bartz driving school, John you are awesome! I thank you so much. I never thought I could ever drive just keep taking transport & walking was my life purpose due to my personal anxiety after a accident at the age 15 stopping me from moving forward Look at me NOW 36 & I have my license. I'm glad the other driving school didn't think I was good enough to reply back to, as your driving school was the right choice for myself. 100% recommend. I'd like to thank David who was very friendly and informative. Thank you so much for helping me get my license, and I would like to recommend Bartz driving school to anybody who is learning to drive. Thanks so much. Absolutely the best driving school out. John was no doubt the best and helped me boost my confidence up when driving. I can't be grateful enough for all he did, and helping me pass my test with flying colours. All thanks to your amazing skills 😉 I can't thank-you enough. Copyright © 2019 2016 Bartz Driving School . All rights reserved.